Still feeling strong and making the most of it at the time! I realize the feeling will subside and I may struggle with workouts, foods, emotions, family and friends, etc; but for now, I’m fired up to succeed! My day was much more productive than yesterday; in terms of food intake. I was disappointed in my protein consumption yesterday. I should have spent more time planning it into each meal more carefully; but we live and learn! And that is exactly what I did today! Can you believe I consumed almost 200 grams of protein today? No cravings or moodiness, either. I was feeling on fire! I proceeded to purchase TONS of chicken breasts and a brand new George Foreman grill. I think I spent almost 4 1/2 hours grilling, baking and stocking the chicken. 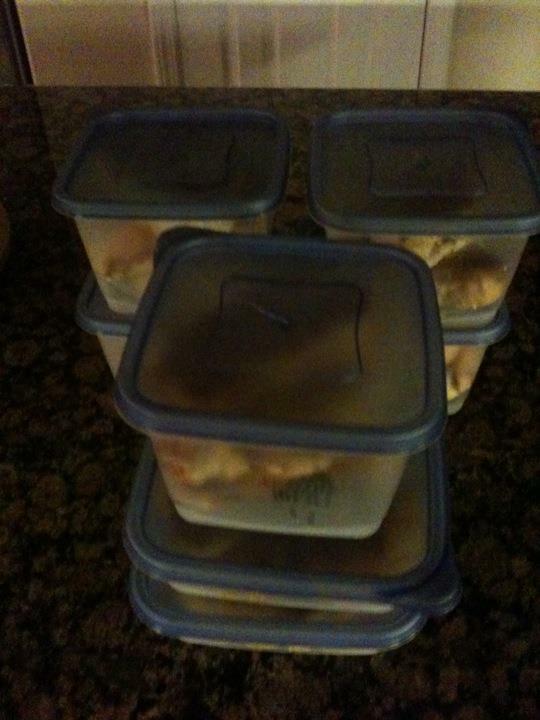 I have enough chicken to last me all week without having to do any “cheating”. What I mean by that is when foods are not readily available to me at exceptionally busy times; I tend to grab a less than perfect alternative. Not this week!! I am overwhelmed by the well wishes I am receiving, now that I have made this awesome commitment. So many others are inspired by the simple decision and healthy additions in people’s lives. What a great experience, this will be! I hope to attend a competition at the end of November to watch my new trainer in “action”; with some of her other clients. I also would like to see how it all runs; in person. Nothing like being prepared; that is something I truly live by every day! I am finding new confidence to run with my dreams. I was also asked to run a marathon in Rome in 2014; following my competing! I don’t even want to contemplate; I will just plan to commit and see it through. Imagine all the possibilities that our lives have to offer!! It’s completely limitless! Don’t stop in your current state; make sure to always push for more and take on new challenges NOW!! Think of how much more interesting people will find you when you are more involved in various and exciting endeavors? Now, it’s time for sleep. Critical for muscle repair and growth. Important for everyone to feel and look better from the inside out! Go have a positive influence on someone! !